Someday My Favorite: all we're missing::gal babes. Well, we for two have had so much fun with this puzzle! Our favorite name guesses so far are Wanda, Awna, Wynona, Leora, and Andon. Keep the guesses coming! 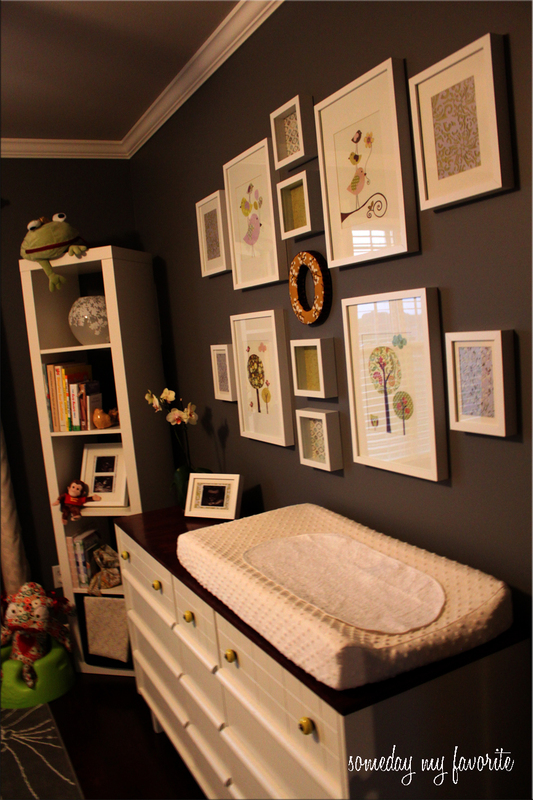 We’ve been focusing on the puzzle and have been remiss in updating you on the nursery. It is finally complete, minus that whole missing babe part. We last left you with evolution::day 11 back in April here, along with a few random glimpses when we introduced you to gal babes’ she monster here. Dandelion bloom vinyls now dance above gal babes’ crib. This was a fairly tedious process, as the vinyl came in numerous pieces that you had to piece together, but we LOVE how it turned out! 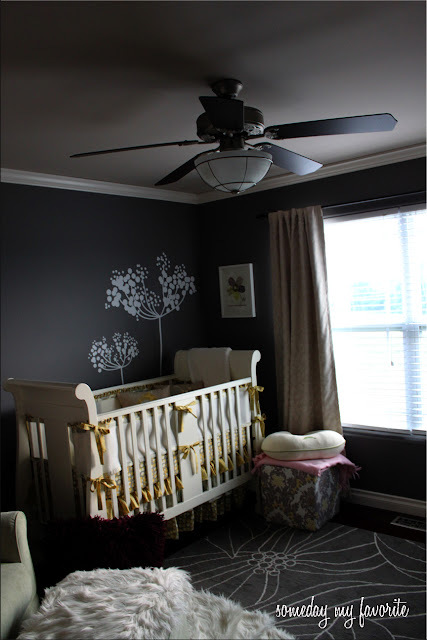 You can find more sweet vinyls from the same etsy store here.The crown molding is up. This little project ended up being a bit more lengthily then we thought. Kerry and I were being optimistically brave in thinking that once we painted the crown molding it would take a few hours to hang. Scratch that, more like a few days. Our corners were wonky, we had two faulty nailers, which resulted in two more crown purchases, which meant three paint sessions in total. Yea, we’re (by we, I mean Kerry) glad it’s over. 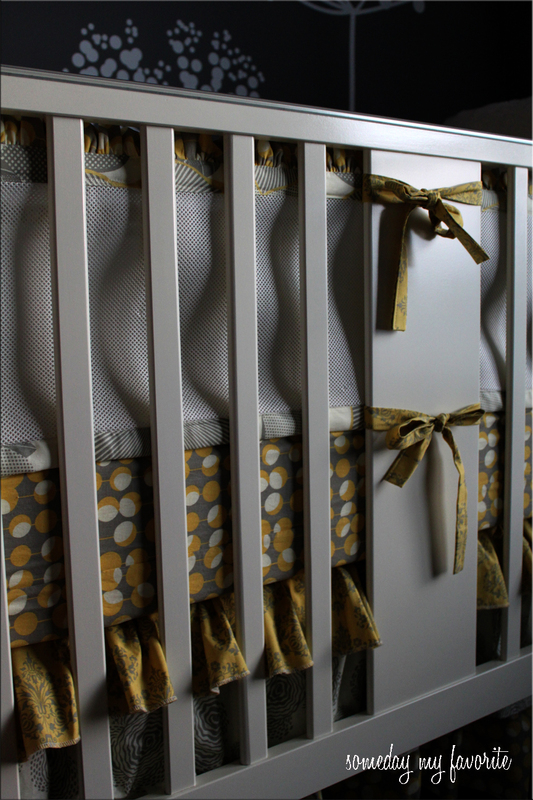 It does do something for the bringing togetherness of the nursery, so are we glad we trudged through it? You bet! We couldn’t be happier! Of course, we would have loved the good ‘ole fashion billowy bumper, but for the sake of all things safe for gal babes, it’s perfect. Now, if she somehow nestles her way to the edge of the crib she can breathe right through the mesh. Gal babes ::read, her parents:: is so blessed with family and friends that have made this nursery exceptionally special. We’ve said it from the beginning, but “baby girl, you have no idea how much you are loved … already.” Now, you’re the only thing that were missing, so just hurry up and get here would ya? Official day count:: 9 ½ days. or just click on the link. haha. geesh, to be a computer wizard = my dream.